314 6th Street SW | Charlottesville, VA 22903 â€“ COMING SOON! Take a sneak peak at our new listing in Charlottesville coming on the market soon!Â This classic 1925 home is in the Fifeville neighborhood. It offers 3 bedrooms, 2 full baths and 1,829 square feet of living space on .14 acres. Charm abounds in the interior of this home. It features an entry foyer, large formal living room, sitting room,Â kitchen with a center island and full bath on the main level. The second level includes 3 bedrooms, an additional full bath with a claw foot tub and a home office with a second staircase leading to the first floor. In addition, a partial, unfinished basement provides extra storage space. A covered front porch and rear screened in deck look out to a nearly level, fenced lot. Landscaping is mature. A new homeowner willing to put in a little sweat equity will find many opportunities to create outdoor spaces for entertaining and relaxing. 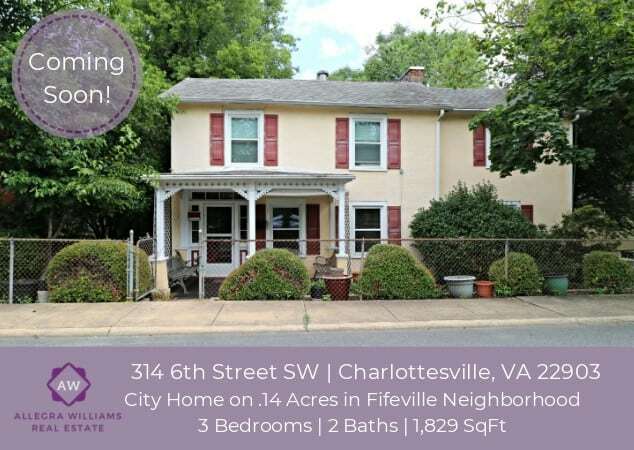 Situated in the heart of the city, this property is conveniently located to everything Charlottesville. This home site is within walking distance to the University, UVA Medical Center, Downtown Charlottesville, shopping, dining, parks, trails and more. There are endlessÂ possibilities to create the home of your dreams in this city charmer! Home is sold in “as is” condition, but absolutely move in ready for the right person. This upcoming Charlottesville home listing located at 314 6th Street SW | Charlottesville, VA 22903 is proudly presented byÂ Allegra Williams with Keller Williams Realty. Â If youâ€™d like to find out more information, please contact Allegra at 434.882.1055.